Carrying on a family tradition, Carolyn Friedman Frank has followed in her father's footsteps. 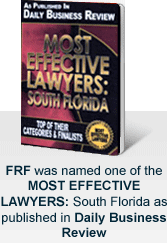 Carolyn is partner in Friedman, Rodman & Frank that has roots in the Miami Beach firm of Harvey D. Friedman, P. A., the firm started by her father in 1976. Her work in personal injury includes, workers' compensation, medical malpractice, products liability and nursing home negligence. Carolyn Friedman Frank was admitted to the Florida State Bar in 1996, after earning her Juris Doctorate at the University of Miami. She did her undergraduate work at the University of Pennsylvania, where she obtained her Bachelor of Arts degree. Carolyn is married to an attorney who serves as labor law counsel for an international company.